As part of the monthly New Barn Rider meetings, a group of members was recently invited to the headquarters of Abbey England in Knutsford, and on the night around 40 of us assembled at the warehouse. Most of us were longterm horse owners and riders, and were confused to think there could be an unknown saddlery right in the middle of our local area. We were made welcome by Richard Pickering and Richard Brown, company directors, and the mystery was duly solved. 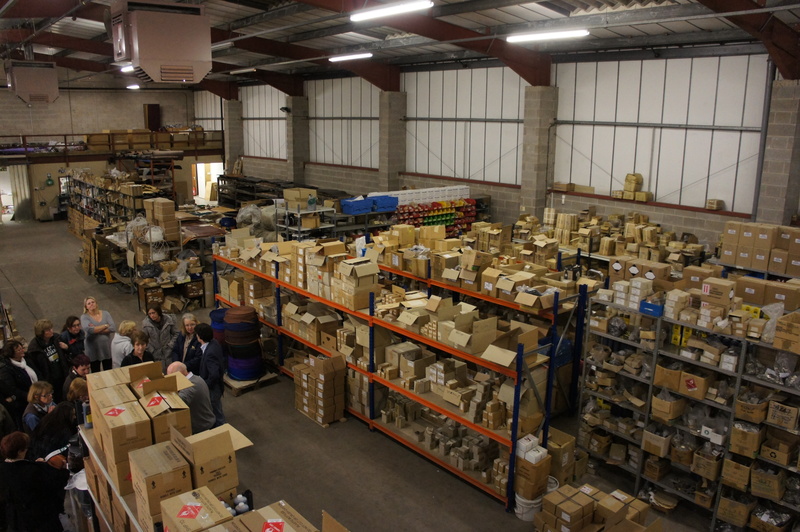 Abbey England are a trade company, supplying directly to saddlers all over the world, and most of us were unaware of the vital part they played in the supply of raw saddlery materials. Richard Brown’s father Gerald, the founder of the company, still comes in every day “to keep an eye on us”, said Richard, smiling. He’s clearly very proud of his father, who was awarded a BETA lifetime achievement award in 2011 for services to the trade. Four years ago, Abbey bought a foundry in Walsall which made metal furnishings such as buckles, stirrup bars and clips, using traditional moulds sometimes centuries old. The company supply to anywhere in the world with an established equestrian trade, including the US, South Africa, Australia, Europe and the Middle East. They currently supply Pinewood Studios with materials, and are currently in discussion with filmmakers in Hollywood. Our group moved through to the warehouse, each of us in turn remarking on the smell as we went in – that mix of leather and saddle soap that’s so evocative. 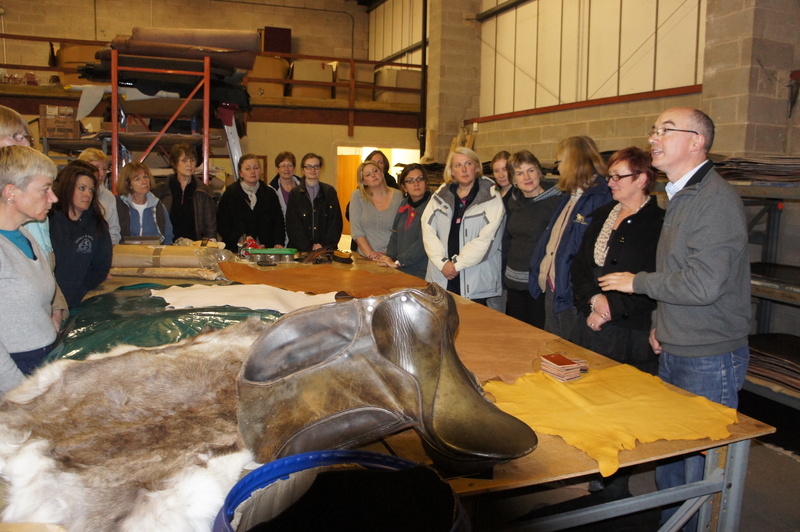 Richard Pickering gathered us round a long table, where samples of leather were spread out for inspection. “Our leather is all ethically sourced, and mostly comes from English and Irish cows, but is tanned in Germany,” he explained. Among the samples on the table were a goatskin, a doeskin, used for sidesaddles, a sheepskin destined for the clothing industry and a pigskin, used for the seat of the sidesaddle. There was even a reindeer skin, used for interior decoration for log cabins. 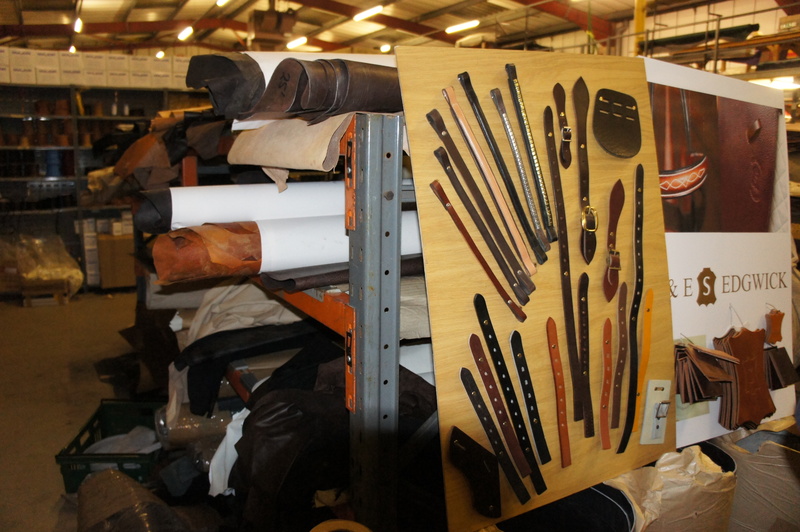 Next up was an array of bridle leather. Having dealt with the subject of what the saddle was made of, we moved onto what it was made on. Richard Pickering showed us a range of trees, both rigid and spring tree. 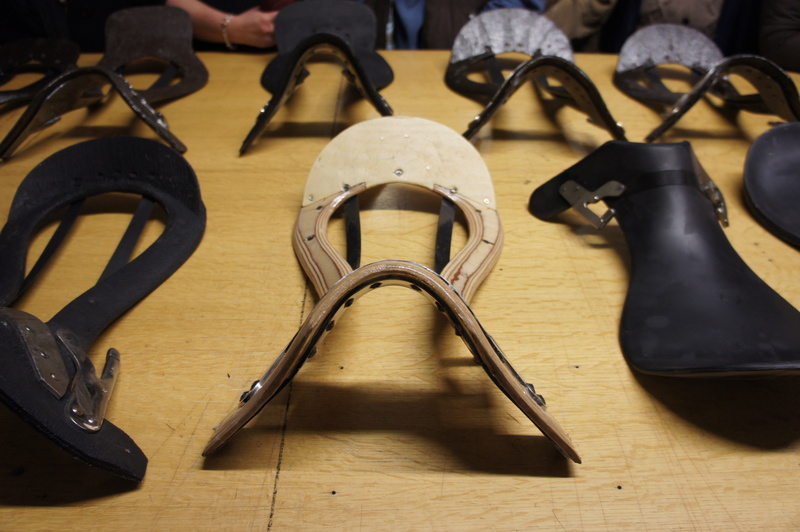 He pointed out how the trees for dressage saddles were cut to allow for the straighter flaps, and how the cantles on some of the saddles were engineering in a single piece rather than bolted on. Having exhausted the possibilities of the saddle – as well as tiring out our hosts – we moved down to explore the metal furnishings section, passing tantalising rolls of Tattersall check, Newmarket stripe and woollen fabrics, destined for horse rugs. I exclaimed over the rolls of old-fashioned canvas, which I remembered from my childhood, and Richard Pickering explained it’s still very popular in France, as it’s more robust than synthetic materials. 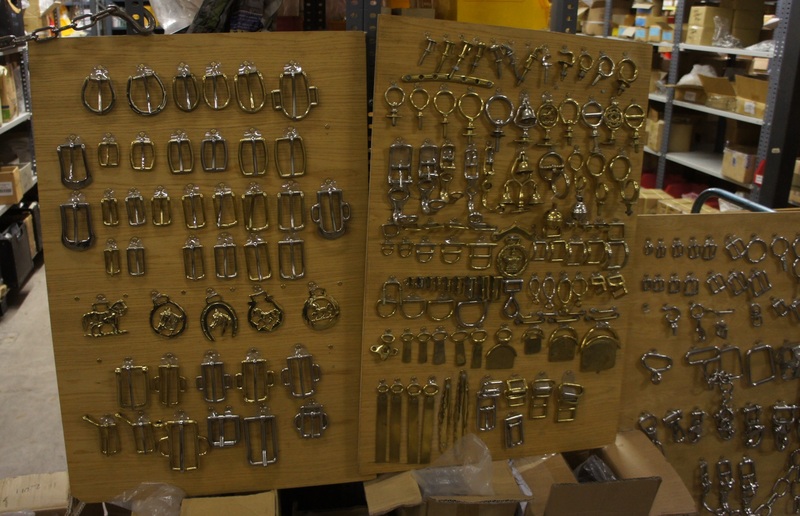 The metal parts are all cast by hand using traditional methods in the company foundry in Walsall, and we saw examples ranging from horse brasses, Newmarket chains and dog collars to a high-fashion belt buckle cast in the shape of a stirrup iron. 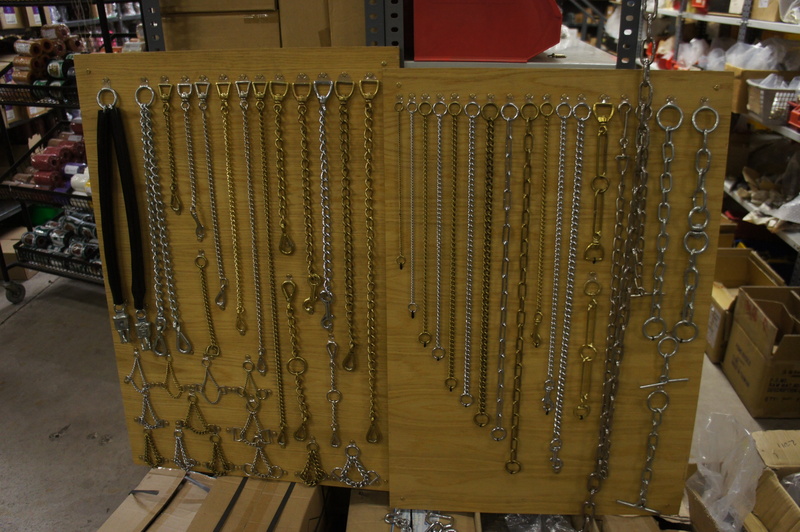 There was also a dizzying array of bits, mainly stainless steel but also copper, brass, vulcanite and sweet iron. The two Richards rounded off the tour by presenting New Barn’s Pam Rigby with a stunning saddle, custom made for use by disabled riders. Made by Irish saddler Shane Mulryan from Abbey materials, the standard GP saddle is customised with removable pads and a handle to give extra support.All the New Barn Riders would like to thank Richard Brown, Richard Pickering and everyone else at Abbey England for giving up their evening and making us all so welcome. Abbey England products are available from retail saddlers nationwide. For more information about the company, visit http://abbeyengland.com/.